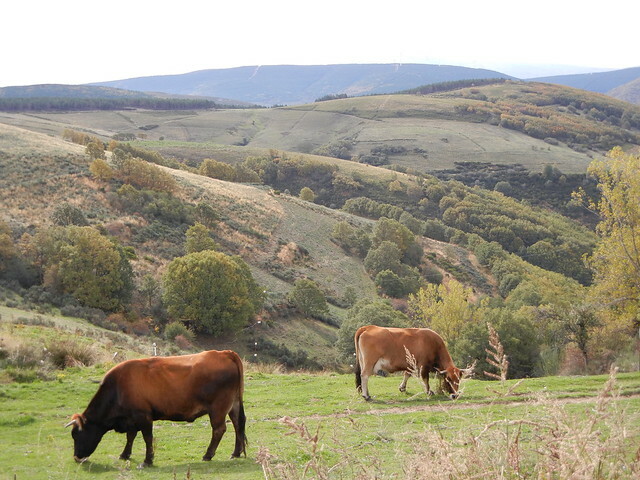 If the Camino taught me anything today, it was about letting go of expectations. 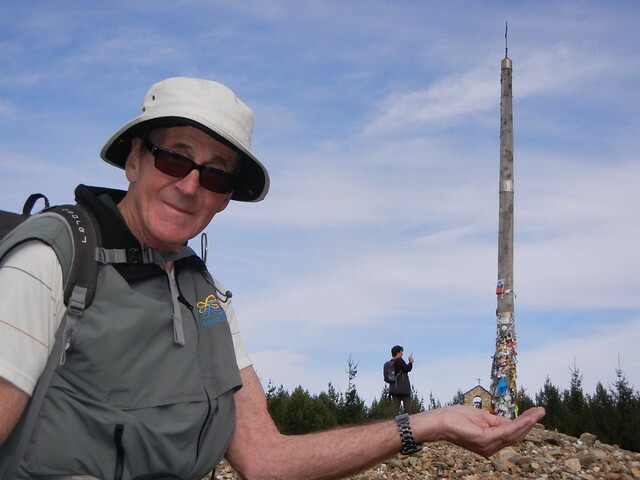 Today we headed out of Rabanal and through the pass of Irago to the highest point of our whole journey: Cruz de Ferro. “This majestic spot stands 1,504 meters above sea level. 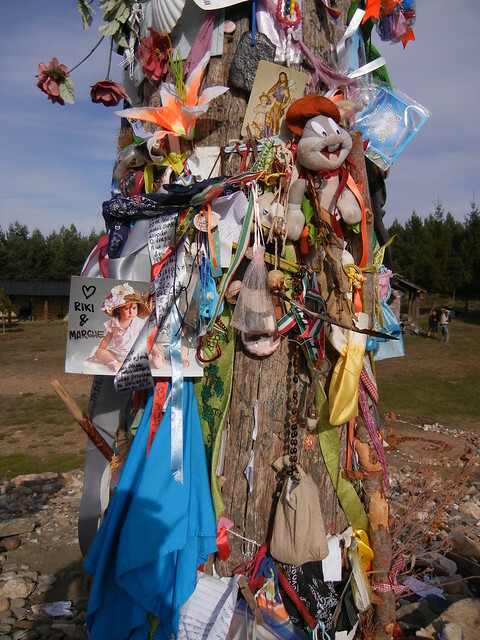 A simple iron cross stands atop a weathered pole that has become one of the abiding symbols of the Camino de Santiago. 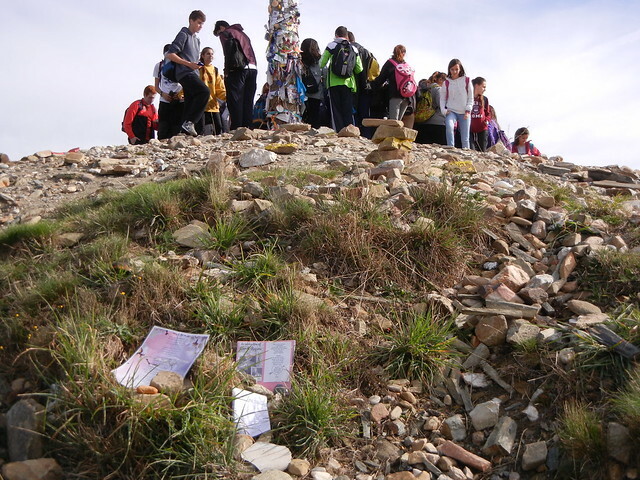 This is where traditionally people pause to reconnect with the purpose of their journey before adding a stone or other token of love and blessing to the great pile that is witnesses to our collective journeying.” That is what we read in the Camino guidebook and what I expected. 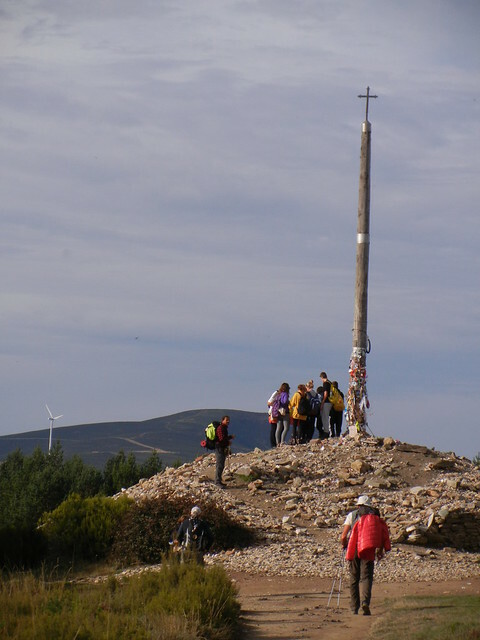 At first I was disappointed because what we experienced at Cruz de Ferro wasn’t what I expected. There was no opportunity for quiet contemplation, to reconnect with the purpose of our journey, or to come to any life changing realizations. We arrived at the same time that a class of flag-waving, rambunctious high school kids were climbing the mound. They were followed by groups taking pictures of one another beside the cross. The mound was as crowded as the Santa Claus parade on Beacon Street! Well, maybe not THAT crowded but almost. Then I reflected on all the quiet contemplation time I’d had during the last 37 days. Because I couldn’t contemplate at Cruz de Ferro didn’t really matter much. 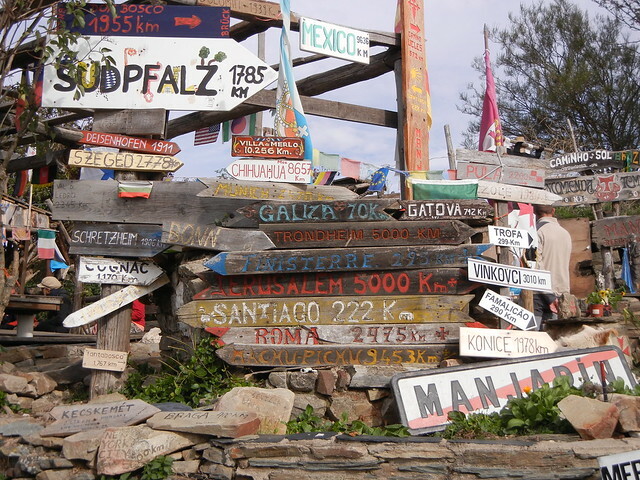 I was always connected to the purpose of my journey all along and it wasn’t going to change at Cruz de Ferro. I wanted to dedicate my journey to my sister, though, and it had to be here! As I walked around the pile I found the perfect place. It was close to the bottom of the pile beside a beautiful poem someone had written about a person they loved. It was a better place than at the top of the mound or pinned to the pole where it would be insignificant amongst everything else that was there. Dave and I climbed to the top of the pile and touched the pole before going over to the park across the road to take more pictures. I was pleased when I noticed someone who was walking around the pile, stop to read. Every morning I look forward to following you through your amazing experience. 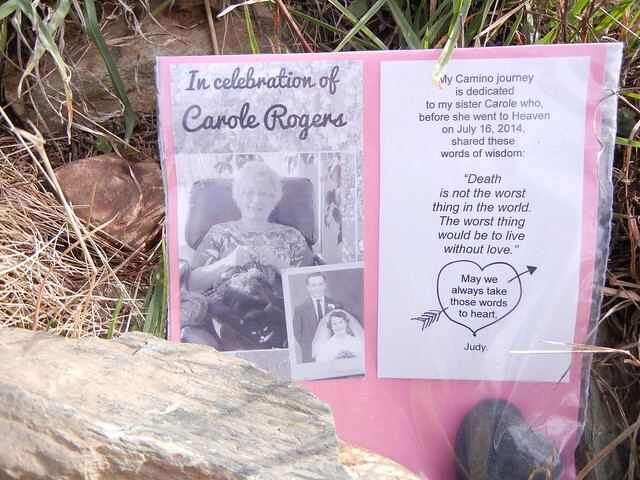 Today I was particularly touched by your lovely tribute to your sister. Her inspirational words and peaceful passing was a lesson for all of us. I’m so glad you dedicated your walk to her memory Judy, and I’m sure you can feel her presence.